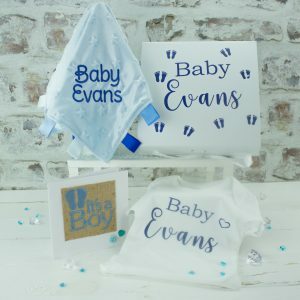 Are you looking for a personalised gift for a baby shower but don't know baby's name yet? 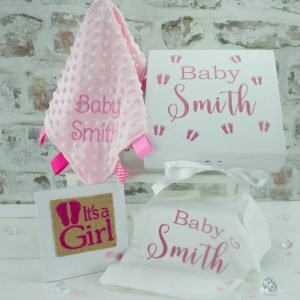 Then look no further than our adorable baby shower gift set, featuring a personalised comforter, baby bodysuit, card & personalised keepsake gift box! 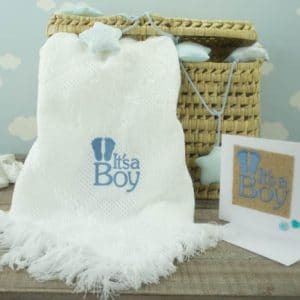 What better way to congratulate Mummy and Daddy than by treating their newborn baby boy to our gorgeous white 100% acrylic fringed edged shawl and Hessian card both perfect keepsakes! Also available in cream. 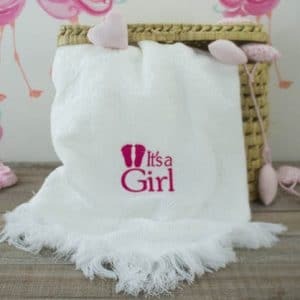 What better way to congratulate Mummy and Daddy than by treating their newborn baby girl to our gorgeous white 100% acrylic fringed edged shawl and Hessian card both perfect keepsakes! Also available in cream. 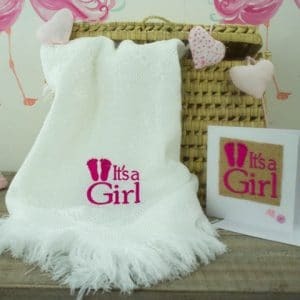 Every Princess needs to look her best whether she's out and about in her pram or taking a well deserved nap, so look no further than our delightful its a girl shawl, specially selected to keep your baby girl cool in the summer and warm in the winter! An ideal gift for every mothers baby shower!